Albér BDS-40 battery monitoring system mounts to the top of a UPS battery cabinet and monitors 12V and 16V sealed batteries. The easy-to-use UPS monitoring system tracks internal resistance, predicting and reporting failing conditions prior to complete failure to allow proactive replacement. Designed and optimized for UPS systems using 12 and 16 volt sealed batteries, the Albér BDS-40 is designed to be mounted on top of the data center battery cabinet and uses custom cables with each connection point identified to the specific battery. Each Albér BDS-40 unit will monitor all the batteries in one cabinet, up to forty (40) cells. 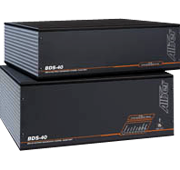 Two different units are available: The BDS-40 Base Unit is the central point where UPS-supplied power and communication connections are made. Each additional battery cabinet in the system may then use a BDS-40 Plus Unit, which transfers the data to the Base Unit for alarm and data storage. Each Base Unit can manage up to five Plus Units for a total of six battery cabinets. Integral Ethernet network card and/or a dial-up modem as standard. Remote notification to third party systems via Modbus and networks. Each system comes complete with the necessary custom length cables to monitor your battery (battery cabinets only).